In the Western Balkans, the human rights of LGBT people are violated on a daily basis. One reason for this situation is that the ruling authorities have not opted for the creation and / or enhancement of institutional and legal elements that would protect LGBT rights. What is missing is a structural incentive for, on one hand, leaving the homophobic practices and, on the other, the pressure to adopt and implement laws that protect LGBT people. Joining the EU is the most important international process that offers these structural initiatives. For the above reasons, the Sarajevo Open Center (SOC) has started implementing the project “Using EU integration process for improvement of LGBT rights in the Western Balkans”. Some of the activities will be: the establishment and promotion of free legal assistance for LGBT people in countries of the region, documentation of LGBT human rights violations, capacity building of civil society organizations, as well as other activities related to the prevention of discrimination and hate crimes in Western Balkans. The overall program objective is to promote respect for and recognition of human rights of LGBT persons in Western Balkans, using the EU accession process as the focal point for targeted, evidence based advocacy relying on information gathered through documentation of cases and research. In addition to Sarajevo Open Centre (BiH), ILGA Europe (Belgium), Labris (Serbia), Subversive Front (Macedonia), Center for Equality and Liberty (Kosovo) and Foundation CURE (BiH) are also involved in the implementation of the project. In 2016 these organisation will work on different activities that are related to discrimination and hate crime linked to LGBT people. Labris will, among other things, work on advocating adequate implementation of national and international policies and standards relevant to LGBT rights in Serbia. It will also create a mechanism for reporting cases of hate crimes at the local level and get the local LGBT community familiar with mechanisms for reporting hate crimes. One of the activities of the Centre for equality and freedom will be the Annual report on the state of LGBT rights in Kosovo in 2016. CEL will also work with the LGBT community and its empowerment to exercise their human rights. Subversive Front will, among other activities, create analysis of the Macedonian anti-discrimination legislation considering sexual orientation and gender identity and its alignment with EU acquis, and other international human rights standards. They also plan to advocate for the prevention of discrimination and hate crime / hate speech on the basis of sexual orientation and gender identity. 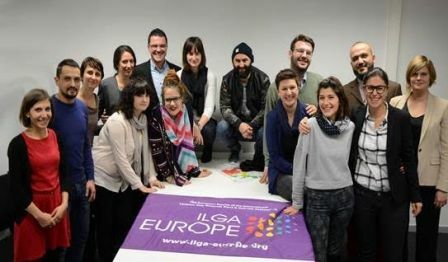 ILGA-Europe willwork ondirect lobbying in Brussels for improvement of the human rights of LGBT people in the Western Balkans but also, among other things, on building capacities of project partners and the organization of the EU study visits. One focus of the CURE Foundation in 2016 will be the analysis of textbooks of secondary schools in BiH that are reproducing stereotypes and prejudice against LGBT people. Based on these results, CURE will also meet the representatives of Ministry of Education and Pedagogical institutes in order to point out necessary changes and contribute to the fight against discriminatory textbooks. The project is financed from the State Department, Bureau of Democracy, Human Rights and Labor in the amount of $ 332,000. The project will last until the end of 2017.